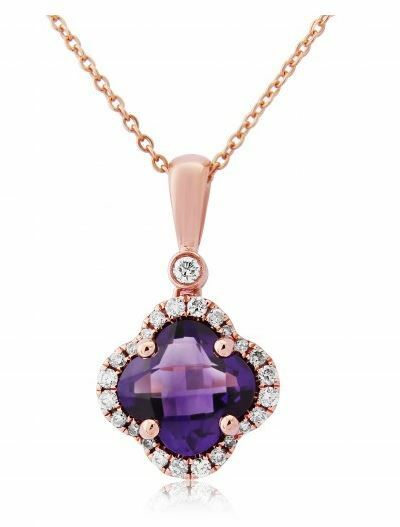 This classic Amethyst stone with an unusual “flower” cut has a checkerboard face that draws your eye to this elegant trinket. Features include a Diamond surround the centre gem, as well as one brilliant Diamond at the beginning of bale. Crafted from 9ct Rose Gold supplied with a fine trace chain, 18 inches in length with option to adjust to 16 Inches. A beautiful and feminine Pendant Necklace with matching ring available.